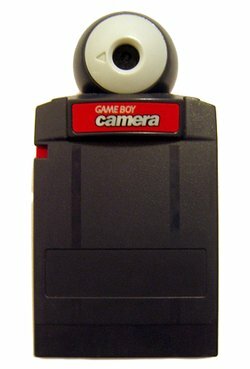 The Game Boy Camera (Pocket Camera in Japan) was a picture-taking device/game for the Game Boy. While its main purpose was taking greyscale photographs it also featured some mini-games and other features built in. It was first available in in four colors: red, yellow, green, and blue. A limited edition gold camera based on The Legend of Zelda: Ocarina of Time was also released as was a Pokémon-themed camera; both featured themed stamps different from those included with the regular cameras. The start options appear as planets and asteroids. The Game Boy Camera has three main modes, covered below. The Game Face game is notable in that the picture taken will appear at least once in every game on the camera, usually as the main character. All photographs taken with the camera are greyscale, with a pixel resolution of 128x112. Hot-Spot is especially good for creating a game where one can go from one photo of a room to another in a house by pressing certain spots (that players can set up) on the photo that will send the player there. One do this by pressing "Select" on the main screen, going to special, and choosing "Hot-Spot" (see list below). Each picture will have 5 One-eyed blobs that can be put on it. Each blob can be programmed to go to send the player to a different photo. Then, in Hot-Spot mode, the places where the player put the blobs will send one to other photos when clicked. At the beginning, two spaceships will appear. One of them will send players to a music sequencer known as "Trippy-H" if shot at, where one can mix sounds and loops. This feature makes simple chiptunes. The other one will send players to Ball, which is also available through shoot. If enough is done in the game, a third spaceship will appear in the middle, and if that is shot at players will be sent to a racing mini-game known as Run! Run! Run!, which is listed as "?" on the left side of the screen. Space Fever II is a homage/sequel to an early Nintendo arcade game called Space Fever. You control a spaceship which fires missiles at other ships. Initially, you will be attacked by other spaceships. The first boss is a giant face of a man with horns, the second boss is a giant face of a mustachioed man, and the third boss's face depends on the pictures taken in "Game Face". Once all 3 of the bosses are beaten, the cycle will start over again, only harder. If this is the first time through, Run! Run! Run! will be unlocked. This is the bonus game, which is obtained by reaching a score of 2,000 or more in Space Fever II. Your head is attached to a cartoon body, and you have to race against a mole and a bird to reach the finish line. Tap rapidly to run, and push + whenever you see a hurdle. Ball is a juggling game, in which the player moves his or her hand around to catch and throw balls in the style of the Game and Watch game of the same name, only with Mr. Game and Watch's head replaced with the player's. Get here by shooting spaceship "D". DJ allows you to mix your own music. Your head will appear on the DJ. To make a tune push . Choose a place and hold , then choose a note with and . Push again and repeat the process. You can also wipe your music by going to the far left or far right while in this game. When you return to the main screen whatever you composed will play as its music. This page was last edited on 15 April 2009, at 20:10.